Pumpkin Peanut Curry | "Il faut goûter"
So I’ve been making lots of wontons lately, and in honor of Fall leaves and gorgeous orange gourds, I wanted to make some wontons filled with a pumpkin mixture. 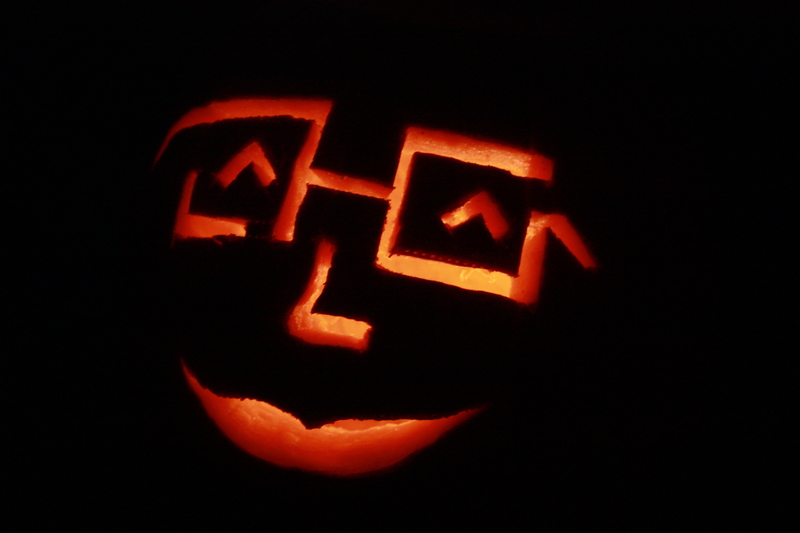 Last Fall I made a Thai-inspired Pumpkin Peanut Pasta with the insides of the jack o’lantern I finally carved. It turned out surprisingly delicious, so that was my inspiration for the wonton filling I set out to create. Yesterday I made a tasty pumpkin mixture with Thai curry paste, coconut milk, peanuts, chili and garlic adding to the tangy bittersweet pumpkin. But while assembling the wontons, I realized this filling just wasn’t quite the right texture to hold up inside the wonton. Too runny. Mom and I fried up a few, grease popping everywhere and even once right under my eye (I’m ok!) as the filling leaked out of the wonton crust into the hot oil. The flavor of the finished product was great, but the texture just wasn’t up to par. So I set that bowl of filling in the fridge, and I slept on my pumpkin wonton dreams. Upon waking, I realized that mixture was destined to become a pot of curry. So I did just that. I added in more coconut milk and tweaked the spice a bit, then I added chicken, carrots, bamboo shoots, and yellow squash. A fantastic curry! Pumpkin complements Thai flavors beautifully–who knew? The peanut’s also perfect. No joke, this is excellent–canned pumpkin gets along quite well with friends other than pie crust and cinnamon! In a small saucepan, heat coconut milk over low heat and add the curry paste. Stir until paste is incorporated into the milk. Stir in the next 11 ingredients and simmer 5 minutes or so. Taste the mixture at this point and adjust seasoning and spiciness to your liking. Stir in meat, seafood, or poultry and cooked vegetables of your choice. Let it all simmer together for 10 minutes or so. At this point you’ll need to taste your sauce again and adjust the sweet/salty/spiciness to your liking. Remember to add only a little at a time, and keep tasting till you love what you taste! Serve over rice. *And for those Pumpkin Wontons, stay tuned–that idea’s not dead at all (it’s just morphing)! 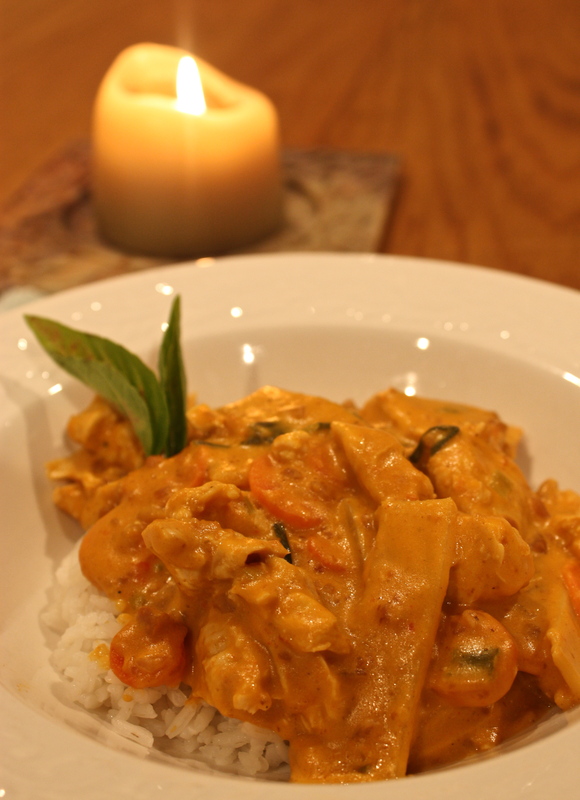 This entry was posted in Savory and tagged canned pumpkin puree, coconut curry, food, great use for canned pumpkin, pumpkin peanut curry, pumpkin season, recipe, thai curry by needtotaste. Bookmark the permalink. Yum! Looks really rich and flavorful. This sounds REALLY TASTY. And that’s coming from someone who is sooooo tired of pumpkin recipe season!